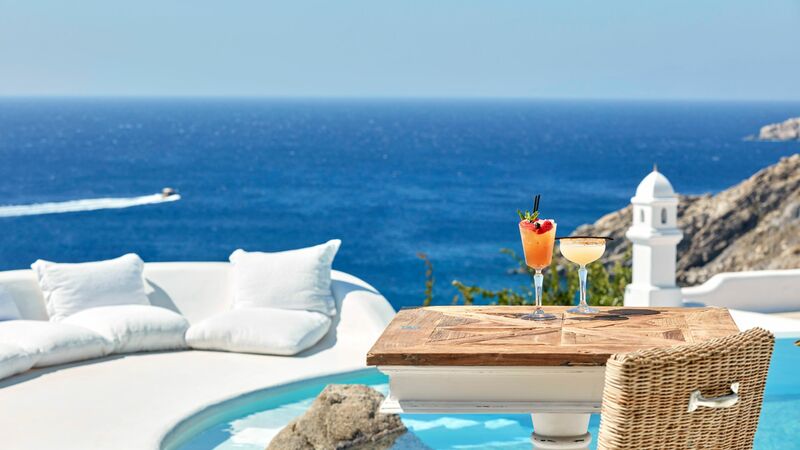 Indulge in the stylish and swanky Kirini My Mykonos Retreat where you will enter a sanctuary of luxury and opulence perfect for couples and honeymooners seeking a tranquil paradise. Enjoy traditional architectural design where guests can select from luxury modern rooms and suites with neutral décor and exceptional sea views. Fully unwind in the soothing environment of the A.Spa where you can choose from a range of treatments including manicures, pedicures, massages, and scrubs. Take a dip in one of three infinity swimming pools before drying off and catching some rays on the plush sun loungers. The Pool Lounge and Cocktail Bar is on hand to serve you cool, refreshing drinks or a pre-dinner cocktail, and when hunger strikes, a gourmet meal awaits at the Anthos Restaurant. 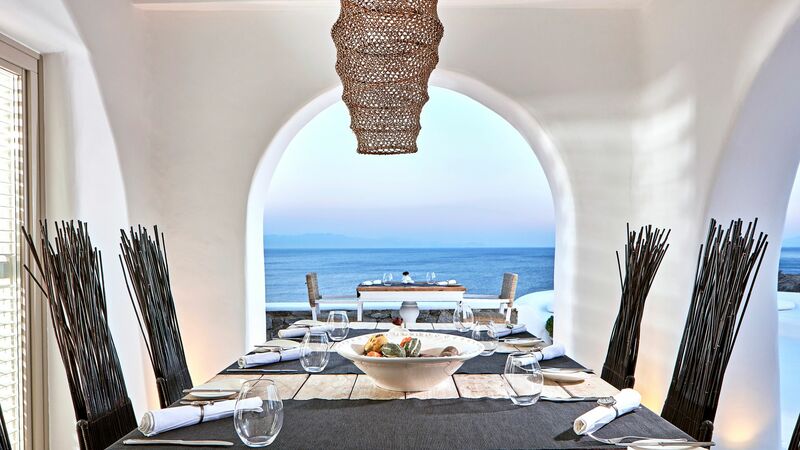 Taste delectable Greek cuisine at its best on the terrace overlooking the Aegean Sea. Sovereign does not accept children under the age of 13 years at this hotel, however this is not an adult-only property. The hotel has 18 rooms and suites. As you dine on the terrace looking out to sea, you will be spoilt for choice with the array of cuisine available at the Anthos Restaurant. Start with an explosive breakfast of fresh fruits, pastries and cooked delicacies, before returning for lunch or dinner. You will then be greeted with gourmet Greek delicacies and Mediterranean specialities alongside international favourites with a modern twist. The expert Sommelier will recommend a fine wine to accompany your meal. No need to wander too far from the pool, when you have cool drinks and refreshing cocktails served at the Pool Lounge and Cocktail Bar. Sit on the terrace and admire the panoramic sea views. Guests can also enjoy light bites and snacks for lunch and dinner. Choose from three infinity swimming pools, bordered by lavish day beds and sun loungers, as you soak up the Mykonos sunshine, while looking out over the Aegean Sea. Indulge in a holistic spa experience rejuvenating the senses, body and mind in a tranquil atmosphere of fully equipped cabins. Treat yourself to a full body massage, spa therapy or beauty treatment from our expert beauticians and therapists who can recommend the perfect treat for you. 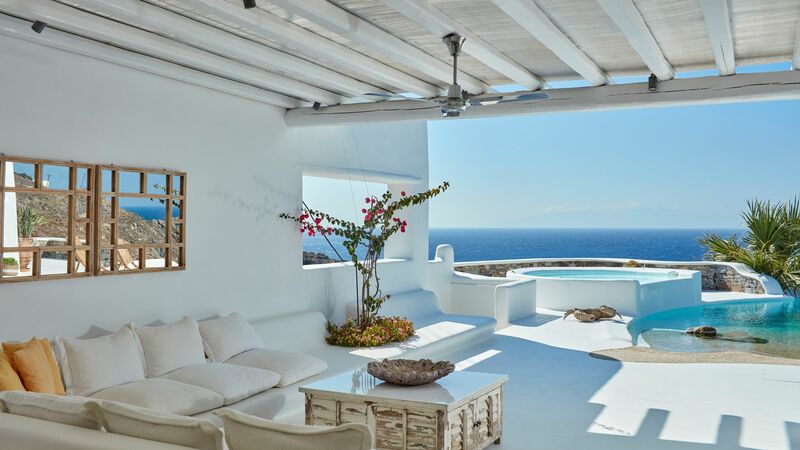 Kirini My Mykonos Retreat is on the south western tip of the stunning island of Mykonos. It’s in the town of Aleomandra where you can take in the rugged natural beauty of the island, as well as its pretty architecture. Spend your days finding your favourite beach where you can lay out your towel and spend long lazy days relaxing, or try some of the water sports on offer. When it comes to day trips, Mykonos Town is perfect. It’s just a 20-minute drive away and is home to a host of trendy restaurants, chic bars and luxury boutiques. It’s home to the whitewashed architecture the island is so famous for, as well as narrow labyrinthine streets where you can wander through art galleries and designer shops. Kirini My Mykonos Retreat is a 15 minute drive from Mykonos Airport. Double Rooms Garden View feature a bedroom, bathroom and a veranda with garden views. Facilities include air conditioning, satellite TV, iPod® docking station, minibar, safe, direct dial phone, Nespresso® coffee machine, hairdryer, bathroom amenities, bathrobes and slippers. Junior Suites Sea View feature a bedroom with an open plan living area, bathroom with shower and a private veranda with sea views. Kirini Vineyard Suites feature two bedrooms, open plan living and dining area, walk in closet, bathroom with shower and private veranda with sea views. Superior Double Rooms Sea View feature an open plan bedroom with sitting area, bathroom with shower and a private veranda with sea views. Save up to 10% on the hotel price for holidays between 01 May - 15 October 2019 booked by 31 March 2019. A bottle of wine and fruits are offered upon arrival for holidays between 01 May - 15 October 2019. This is beautiful place, quiet, relaxing, and very accommodating. However the customer care that Evangelos and Christina provided was surpassing. They help us to make the best of our trip by being informative and sharing their knowledge of Mykonos. Their always pleasant demeanor was very welcoming we felt we were amongst friends! A beautiful hotel with breathtaking views! Super friendly stuff and fantastic breakfast. Also great location if you?? ?re looking to escape from the craziness of the town. Can?? ?t imagine having a more relaxing time! We have never felt such peace and relaxation. We were able to be perfectly still for a few days. The staff was so accommodating, they became our friends. We can?? ?t wait to return. The food and drinks were delish and made with care.